Northern Ireland’s Transport Minister Danny Kennedy has named consortium BAM/McCann construction contractor to dual part of the A26 in County Antrim. Work on the 8km scheme is expected to start by the end of this year, running for a period of 28 months, with completion anticipated in early to mid 2017. The project will create new jobs in the local area. 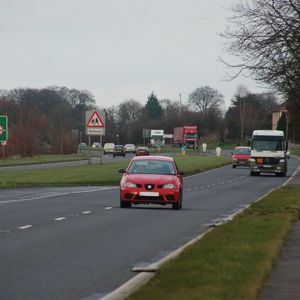 The project represents an investment of £55M including land acquisition, and will see the consortium upgrade the existing single carriageway to dual carriageway between Glarryford and the A44 Drones Road Junction. The A26 is part of the ‘Northern Key Transport Corridor’ that connects Belfast to Antrim, Ballymena, Ballymoney, Coleraine, Limavady and Londonderry. This latest improvement scheme will be predominately online, meaning the upgrade is to closely follow the existing road alignment. Advanced works commenced in January this year and are being carried out by Patrick Bradley & Sons. This includes site clearance, the removal of vegetation, the erection of the site boundary fence and archaeological investigations. Mr Kennedy added: “This is a strategically important route which links Belfast to the north coast of Northern Ireland and its most popular tourist attractions.